Looking for outdoor advertising displays at wholesale prices? Find custom printed block flags on the market at affordable prices, in stock, at this website. These giant banners are inexpensive solutions with high visual impact, boasting longevity over time due to high quality materials and design. 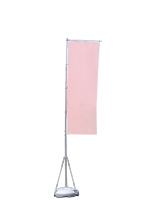 These block flags for promotional use are the tallest rectangular flutter signs on the market. Each of these vertical polyester signs is quickly becoming a leading choice for exterior marketing due to rugged construction that withstands the elements. These block flags, also known as giant advertising banners, are constructed of heavy-duty extruded aluminum and molded polymer, which can be knocked down for easy transport. These custom printed flutter signs with sturdy bases are not only portable, but one person can set them up without assistance. 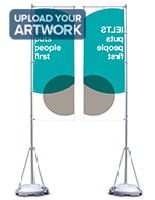 What are some of specifications and features of these vertical advertising banners & poles? These block flags come in heights of 9.8’, 13’ and 17’, and literally tower over the competition. The polymer base, which holds our larger signage, is a 31.5" square that measures 7.5" tall and folds in half for easy transport. It can hold about 18 gallons of sand or water to keep the unit stabilized. The entire dry weight of our largest and heaviest display is only 25 lbs. and can be moved easily by just one individual. 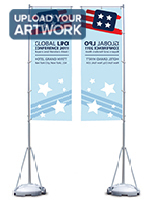 These flagpoles are engineered to accommodate advertising flags which measure between 43.3 inches wide by 155 inches tall and 28 inches by 98 inches. 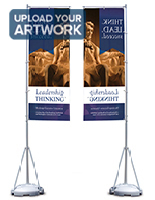 Our tallest selection, referred to as a giantpole or giant banner, has four legs attached to a fillable base for extra stability. These fixtures are ideal for promotional messaging and imparting information to the public and prospective customers in short order. The flags and block banners by stature are exceedingly tall, so they can catch attention from great distances. These flagpoles for business are engineered specifically for exterior use but they are becoming increasingly popular among indoor dealerships, trade shows and conventions. Browse our in stock selection of custom flags and banners for all the highest quality displays at the lowest prices. 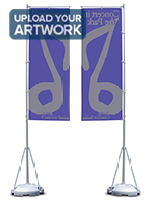 Buy online outdoor banner poles with vibrant personalize messaging to hit your messages home. Order in bulk for steep savings. 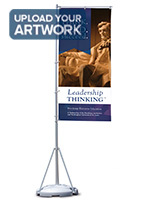 Select individual outdoor banner poles to reinforce company and organizational brands. Look through the entire online collection now for all the highest quality displays at the lowest prices. What traits separate these advertising flag fixtures from other flagpoles, windsocks or flutter flags? 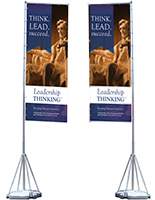 These banner stands each have a support arm that ensures pennants are open and visible even when there is little or no wind. These arms are free to rotate around the stands with the wind. This ability creates eye-catching motion and allows the pole to function in higher winds than other fixtures. These merchandise are typically combined with custom printed imagery that allows businesses to tailor marketing messages. These polyester signs are designed to be easily broken down ensuring that the entire display is lightweight and highly portable. Portability is essential, and having functional yet easy-to-use outdoor fixtures are indispensable when it comes to publicizing sales effectively. These 17 foot, 13 foot and 9.8 foot fluttering banners and printed flags are among the most sought after rectangular flutter signage on the market. The flying signs with foldable bases are suited for indoor or exterior applications. 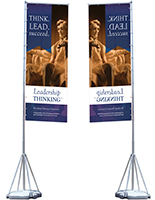 The advertising feather banners stand over 17 feet high and are built to hold giant, personalized images or text. 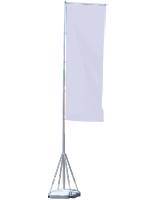 These wind sock displays are made to withstand moderate wind, rain or snow. They even come equipped with long-lasting polymer bases that can be filled with sand or water for stability in winds up to 31 mph. The rotating arm also lets the flags displace with the wind, effectively preventing the unit from tipping over. Although widely suited for outdoor applications, these pennants are great for interior functions! They are set up in lobbies, atriums, convention halls, car dealerships or everywhere with enough headroom. Despite their substantial size, these flags for advertising are lightweight, portable and easy to mount. 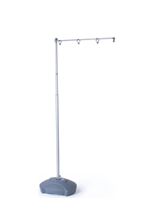 Formulated with a convenient telescoping pole, the display collapses easily and can be setup by just one person. These sign holders come with two carrying bags for even easier transport and storage. 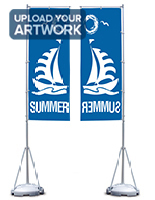 The poles are sold with or without graphics; however, you can select from all kinds of pennant options in our online warehouse that are sold individually. In addition, we can print your individual graphics for you. Purchase with silk-screened or digitally transcribed imagery, and choose from one- or two-sided knitted polyester fabric. These sign systems will look new season after season, and will maintain their vibrance even after use at hundreds of marketing events.